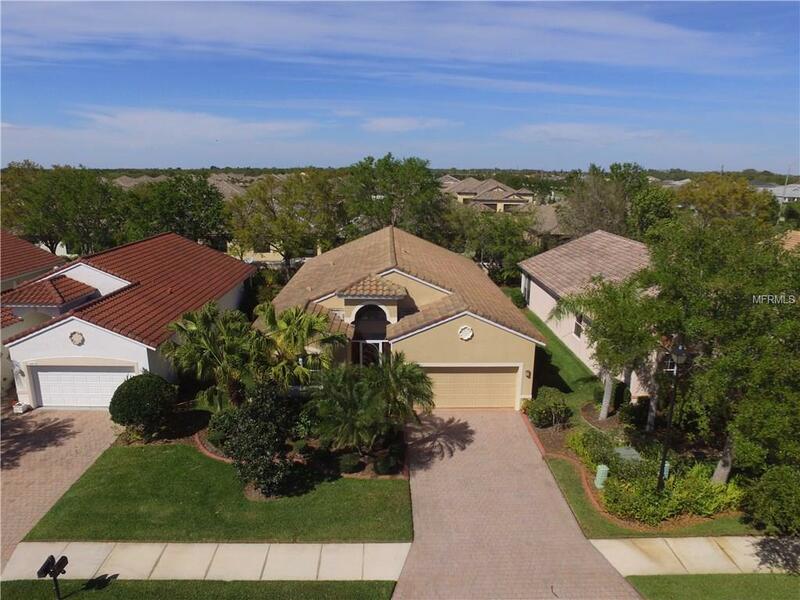 Absolutely stunning home in Sarasotas most desirable 55+ & maintenance-free communities: The Cascades! This immaculate 2 BR + den (can be used as a 3rd BR), 2 baths, 1,980 sq ft w/ open floor plan sits on a cul-de-sac st. Ceramic tile & wood laminate flooring everywhere. Tile roof & brick paver driveway. On top of builder upgrades, the owner added $41,000+ in additional items: A/C (2017), Hot water tank (2015), Double pane windows (2015), master bath shower (2012), Guest bath Roman shower (2015), Exterior painted (2012), Garage floor epoxy (2016), Extra storage in garage (2008), easy to use accordion hurricane shutters (2008), flooring (2009), whole house water softener, and & enclosed lanai (2007). Split floor plan w/ luxurious master suite w/ his & her walk-in closets. Bath has dual vanities, walk-in shower & garden tub. The guest BR has Murphy bed. The large lanai has been enclosed with sliders that allow year-round enjoyment w/ extra sq ft.. brick pavers in the lanai. A non-smoking home. Quality landscaping around home. The Cascades community offers an abundance of amenities & activities: heated indoor/outdoor pool, spa, water aerobics, fully equipped fitness center, Har-Tru tennis courts, pickleball, bocce ball, horseshoes & a whole lot more. The community has a clubhouse and full-time activities director, all just a short walk from your doorstep. HOA fess include lawn maintenance and irrigation, basic cable and internet. Centrally located, close to UTC Mall, downtown Sarasota & white sandy beaches!